Some people call it ingenious, while others saw it as an act of desperation. 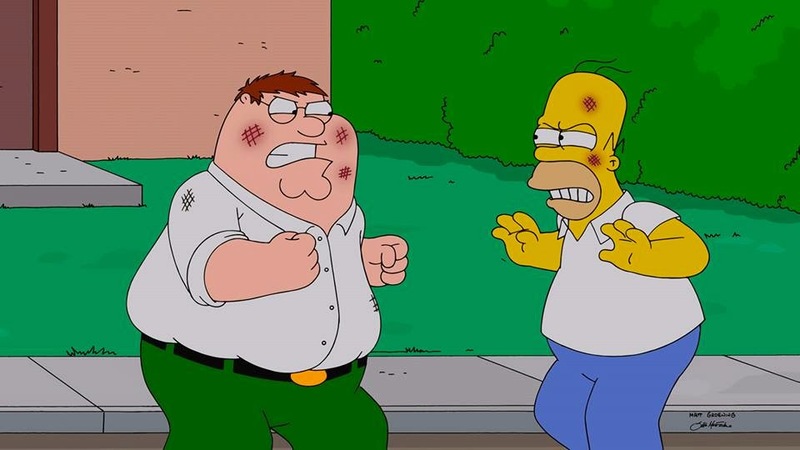 Either way, the Family Guy/Simpsons cross over episode gave fans everything they wanted and more. While it's true that the ratings of both shows are not great, the franchises mean millions of dollars for FOX, not to mention that every new episode means syndication money, and that's why these shows have stuck around for as long as they have. In this very special episode, Peter and his family are forced to leave Quahog, after once again offending a large group of people. While on the road, they stop for gas and wind up having their car stolen. The Griffin's end up in a local town called Springfield, where as Brian puts it, "everyone looks like they have hepatitis." In many ways the shows are similar, many even call Family Guy nothing more than an edgier version of The Simpsons, and if you didn't think that before, it comes across crystal clearly in this episode. Over the years and due to shows like South Park and Family Guy, the Simpsons don't seem as edgy as they once did, but I thought the crossover brought out the best in them. In many ways, for the Simpson's it was a return to it's roots, as we got the famous catch phrases, hardly uttered at all anymore, and saw some of the things that drew us to the show in the first place. As for Family Guy is was just another episode for them, incorporating their own unique brand into Springfield. Two things that particularly stood out (You'll want to stop reading if you haven't seen the episode yet) were the cameos from other animated shows on FOX and the court room scene where all the similar characters from Springfield and Quahog were sitting next to each other and interacting. This was the kind of idea that could lead to a huge movie, maybe the Simpsons 2: Road To Quahog? Either way the crossover was terrific and should be a huge ratings grabber for FOX, and for all you Matt Groening fans, this isn't the only crossover you'll see this season, as a Futurama crossover is scheduled for sweeps week.